Just move between Liki 4 product stages as your child grows. The ingenious Liki Trike simply folds and unfolds at the click of a button. Parent Mode Folded: Assembled Dimensions: 24L x 50W x 103H cm!! Liki comes fully assembled and can be used straight out of the box with no assembly required. Made from the highest grade of fibre-reinforced polymers, rust-free aluminium, and solid PU wheels, Liki brings children car seat and stroller safety and innovation to the trike market. The urban street design of Liki allows you to be cool, safe and have fun. And its unique patented small fold allows you to easily travel with your Liki, just click and fold and it will easily fit into the boot of your car or even your hand luggage. Stage 1: Parent mode: 10-18 months With: Backrest, Canopy, Protective bar, Parent control bar, footrest. 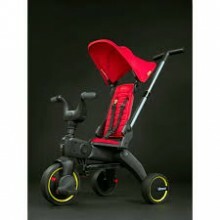 Stage 2: Push mode: 18-24 months With: Parent control bar, Backrest, Footrest. Stage 3: Tricycle mode: 24-30 months With: Backrest, Parent control bar, Pedal. Stage 4: Bike mode: 30-36 months With: Pedals, Lower Backrest. Click the button below to add the Doona Liki Trike to your wish list.